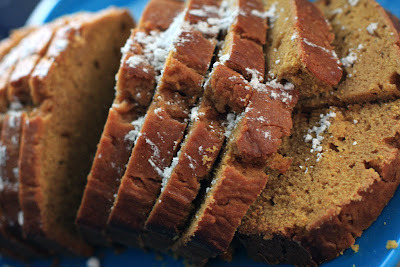 We have a new favorite around our house, nice warm Pumpkin bread. My kids love it, and so does Dad. I thought it would be super yum with some cream cheese mixed in, but we are trying to keep it more on the healthy side. It’s really moist, you should give it a try. Butter and flour a 9x5x3-inch loaf pan; set aside. In a mixing bowl, cream butter and sugar; add eggs and continue beating until light and fluffy. Sift together the flour, nutmeg, cloves, cinnamon, baking soda, and salt. Add about 1/3 of the sifted ingredients to the creamed mixture; mix well. Stir in milk. Add remaining sifted ingredients alternately with the pumpkin purée. Pour batter into pan. Bake pumpkin cake at 350° for 50 minutes, although I took mine out about 5 minutes early . Cool in pan for 10 minutes.